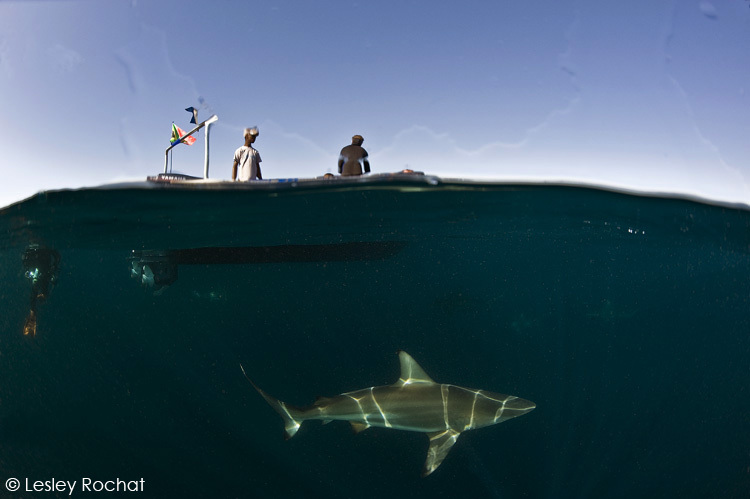 I am blessed to be following my passion and doing what I love most, fighting for our oceans and finding compelling ways of raising awareness and educating the general public about the importance of conserving our beautiful oceans and in particular, our majestic sharks. Photography is an important part of my work and I am currently on a photographic journey for a new project. This journey will take me some time to complete and the end result will be amongst other things this blog, a book, documentary inserts, articles, and ultimately an awareness campaign which will take me to many parts of the globe in my fight to help save our oceans. I can’t accomplish this alone and many people and sponsors are helping me to fulfill this mission – to all I am eternally grateful. Sometimes I will be touching base back at the AfriOceans office, catching up and fulfilling other obligations and driving other projects, which I will also share with you, and then back on the road again to continue. As this journey unfolds I will share some of my experiences on my blog of the special places, people, and animals I am privileged to meet. This project has significant meaning for me: In recent times I have been set free of others and their demands of me and for this project I owe nothing to anyone and I don’t need to prove a thing to a single soul, not even myself. All I have to do is be in integrity with myself and do what I love most. This is at once a frightening, wonderful, free and uplifting place to find myself, and it is here that I surrender and embrace this photographic project. With no set map or plan, armed only with my cameras and passion, I go where the animals call, where the people inspire me, and believing that my little bit will make a difference, no matter how humble. My journey begins in Durban. 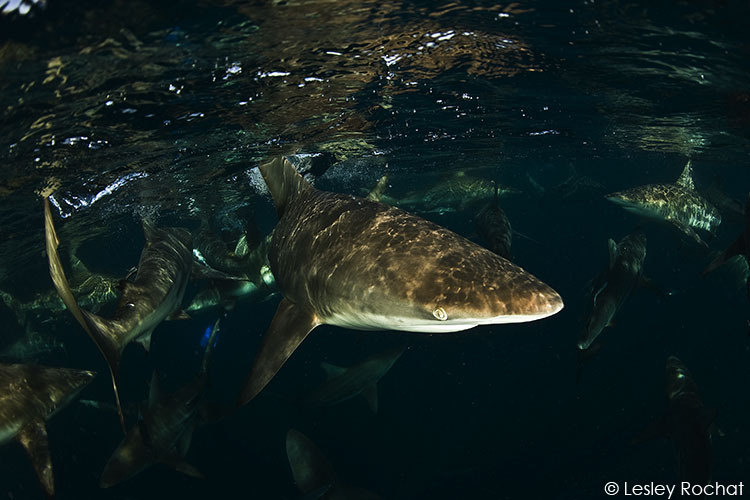 The special place is Aliwal Shoal, the special people are Walter and Sandy Bernadis of African Watersports, and the special animals are the black tip sharks I so love to dive with. I’m here to join kindred ocean warrior, born on the same day as me, Michael Aw, world famous underwater photographer whose countless awards and superior skills make *some of the best of South Africa’s underwater photographers look silly (*in particular those whose egos transcend Earth – addition made to clarify blog comments made :-)). He is here with a group to dive with the sharks and then to join the spectacular sardine run. 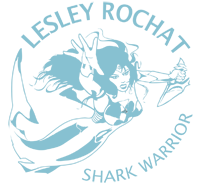 African Watersports is a family business which is run slickly and professionally. I like the fact that it is a family business, the personal touch it brings. Walter, a strong, determined character with an abounding passion for the ocean and countless hours on and in the sea, heads the operation, which has been running for over 10 years. There is a sense of fearlessness and combined calm about Walter, earned only through years of experience and understanding of the oceans. He gives me the feeling that he is the kinda guy one would want around if ever there was a diving crisis. He is already south when I arrive, preparing for our arrival for the run. Sandy, his petite, attractive wife, runs the ship – she handles the bookings and their comfortable guest house named Seascape, and the many demands of visiting guests with aplomb. Mark, their son, has not fallen far from the tree when it comes to a passion for the oceans, and with his quirky sense of humor he leads our dive with the sharks. As always, even if the tiger sharks don’t appear, it is an awesome experience to have 40 or so black tips surround one. Each time I go I try to capture something new, something artful and original. 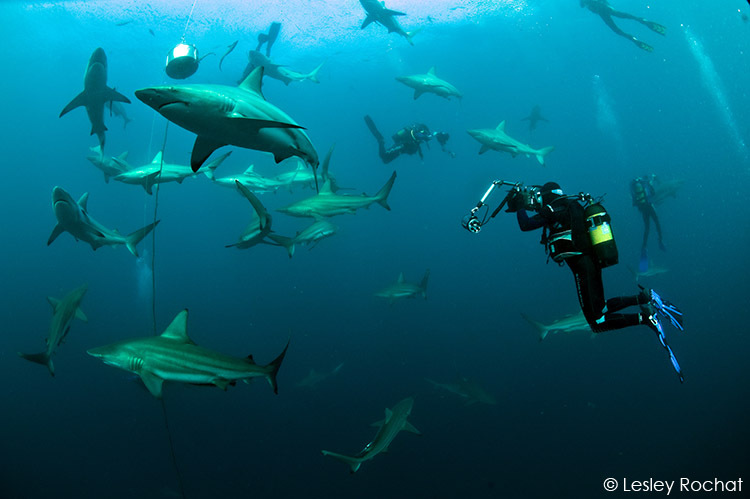 With so many great underwater photographers out there it is a challenge not easily achieved. I have dived with the blacktips and it really is an awesome experience! Great photos of the sharks and look forward to seeing what you get on the run 🙂 Would love to see that too one day. Wonderful pics Les! Can’t wait to see the rest. So glad to hear you will be doing a book. I have been following your work for a few years now.Your work is awesome and I think you are definately one of the best underwater photographers around. Love your blog 2. I love sharks and the oceans and appreciate what people like you are doing to help them. More people should dive with them. I have and it was a high light of my life. Once you have done that it opens up a new appreciation for them. They are awesome! 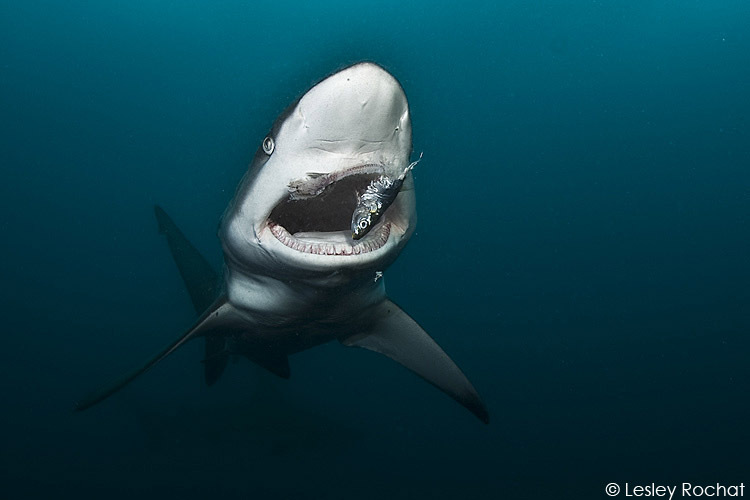 >> I’m here to join kindred ocean warrior, born on the same day as me, Michael Aw, world famous underwater photographer whose countless awards and >>superior skills make the best of South Africa’s underwater photographers look silly. Hi Alexander, well I think it depends on who you are a fan of and photo art appreciation is a matter of personal opinion just like any other form of art appreciation. Photographers like Michael and a few others who have been taking underwater pix way longer than most are, in my opinion, in a class of their own, which young in the industry photographers are still to earn and reach. Hi Alexander. I think Lesley's response to your comment was correct, but very diplomatic. It's absurd to start making claims about how one photographer makes others look silly? I'm sure Michael himself would not appreciate hearing this either. As Lesley said, photography is art, a photographer shoots for himself or herself, their images are a reflection of how they see a subject, and how they are inspired to present that subject to the viewer. There's is no good or bad, its simply a matter of taste. You may like photographer X for their style, photographer Y will be preferred by another. Simple. My suggestion is that you should start looking at different work not with a critical eye, but simple with interest to see, and learn, and take small pieces from each. Its far more rewarding, and you'll smile more, and at the end of the day, everyone will be happier. Jeff, thanks for that, agree with you to a point but like with any art form there are those that are a lot better than others, those with a gift and those that no matter how hard they try will never match up. Today because of digital photography there are a lot of good underwater photographers and some really gifted new photographers around. Those who have been doing this longer than the rest certainly remain a league of their own, in particular the gifted ones – how can they not after over 20 years plus experience? 'Silly', well, that too is a matter of creative expression and my every word should not be hung on. PS: see edited * to clarify comment. Happy photographing guys. Super cute! My little man would look so stylin' in those! ibahnq ibahnq – Hermes Kelly Handbags.